It is not enough for the UN to organize “funeral wakes and shed crocodile tears” for Syria at the Security Council (see yesterday’s post). Telling us as it did, that “we have not seen a refugee outflow escalate at such a frightening rate since the Rwandan genocide,” is not helpful either. 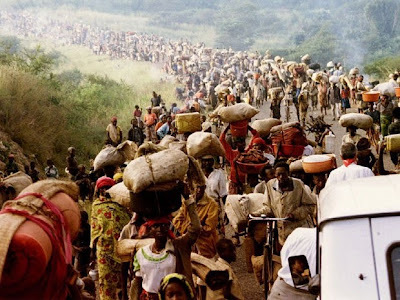 It is more useful for the UN to do something concrete to stop this infamy, which is worse than the massacres and genocide committed in Rwanda almost 20 years ago. The Rwandan disaster took place in Africa’s jungles, relatively far from the world’s public eye. But the daily massacres in Syria are being aired straightaway to every home around the globe. Still, the Syria “Massacre’s International Department” is keen to see the pace of the killings continue unabated. American apathy and Russian bigotry are the two faces of one and the same despicable, heinous and criminal policy. Political solutions were foiled at the Arab League, then by a Russian veto at the UN Security Council, and since at the “Geneva Conference” farce… But the UN finds nothing better than wail the 100,000 Syrian deaths and the estimated killing of another 5,000 every month. In Rwanda, the Hutus and Tutsis slaughtered each other as Bill Clinton stood idly by and just watched the slaughter. Using a political metaphor, Obama represents the Hutus and Putin the Tutsis. Both have no qualms about watching the slaughter until Syria is totally destroyed. In the process, the largest number of Islamic extremists and jihadists would be killed alongside as many Iranians, Iraqis and Hezbollah Lebanese as possible, which would also wear down Iran. Communism collapsed in Eastern Europe in 1989, and two years later in the Soviet Union. Some read in the two downfalls the End of History; others declared the end of the Cold War. Russia was a bankrupt nation ruled by an addict called Boris Yeltsin while China’s economy was still predominantly rural. But the march of history never stops and history variables are unpredictable. The past decade saw the collapse of the U.S. economy, which was partly pulled down by the Iraq adventure. It also witnessed the rise of China to economic giant status. That’s when the Russians sought to take advantage of America’s enfeeblement and Europe’s fatigue and make a comeback on the international stage, using their Soviet forerunners’ wiles: the Cold War. In a sense, the Cold War means waging hot wars away from your homeland – Vietnam, Angola, Cuba, the Balkans, the Middle East, Indonesia, Lebanon, Korea and scores of other places. That’s what the two sides do, but always covertly. The Russians perceived in America’s exit from Iraq, her failure in Afghanistan and her financial meltdown a suitable window to recoup the role of equals in a bipolar world. Realizing the West was shutting them out from Africa after the change in Libya, the Chinese chose to warm up to their traditionally hated partners, the Russians. A golden opportunity came knocking with the explosion in Syria, an old Moscow lover despite her flings with the Americans in Lebanon and Iraq. At the UN Security Council, the Russians pulled their veto sword from its sheath in anticipation of a duel. They were surprised to find a bystander instead of an adversary. They found Obama playing the old Soviet role -- passionate verbosity and hot air. In this crisscross painting of the battle scene, Putin visited America’s two principal military allies in the region, Israel and Turkey. People who expected Obama to change tack in his second term saw him replace Hillary Clinton with John Kerry. American ambulation and cogitation supplanted the ragged Russian footwork. In the tug-of-war, nuclear Iran played the role of nuclear Cuba with cold, limited and timid Russian backing and American cautioning. While the Russians and Americans weighed their moves, and China pondered the words of her Security Council representative, 100,000 Syrians were killed and 10 million displaced. The quintessence of the conflict changed from Hama to Qusayr, the MiGs destroyed a quarter of Syria, the Middle East toppled over and the ultimate peril of sectarian conflict ignited.